Sergio Marchionne, comfortable discussing jazz musicians or quoting Machiavelli, leads the crew trying to give Chrysler an image makeover. DETROIT -- Call him the philosopher king, or maybe the philosopher CEO. Chrysler Group's Sergio Marchionne says the company's survival plan has roots in the work of Italian political philosopher Niccolo Machiavelli. 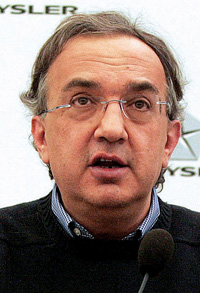 "A return to first principles in a republic is sometimes caused by the simple virtues of one man," Marchionne quoted Machiavelli last week at the presentation of Chrysler's five-year plan under the control of Fiat S.p.A.
"The 2010-2014 plan at Chrysler, when all is said and done, is a commitment to build an enterprise of men and women of virtue." Starting with Marchionne, a 57-year-old Italian-Canadian accountant and lawyer, that enterprise has some distinctive personalities who differ sharply from the people who ran the company during the Daimler AG and Cerberus Capital Management years. Marchionne's thinker's approach and wry sense of humor contrast with the style of his predecessor, Bob Nardelli, the Cerberus hired gun who was brusque and businesslike and tended to speak in corporate jargon. The rest of the new 25-member Chrysler leadership team includes five women, three Italians, two Brits, two Canadians, a Frenchman and a Lebanon-born U.S.-French citizen. In addition to Marchionne, five are Fiat transplants and several are Chrysler lifers. The group includes veterans of Nissan, Toyota, Ford and Citroen. Fifteen of them spoke Wednesday, Nov. 4, at Chrysler's eight-plus-hour presentation of the five-year plan. Ralph Gilles, senior vice president of product design and newly appointed Dodge CEO, was the only presenter besides the sweater-clad Marchionne to forgo a necktie. In a black dress shirt and black sport coat, Gilles spoke about being brought to tears by his passion for cars. He said his eyes welled up when he drove Fiats in Italy and felt how well they handled. Fred Diaz, CEO of the new separate Ram truck brand, has dealer fans from his recent position heading Chrysler's business center in Denver. He alternated between dramatic readings from the new "My name is Ram" commercial and stories about growing up poor on the south side of San Antonio. Diaz took a break from English to quote his grandfather's Spanish saying, which translates: "Trucks are for Texas, and Texas is for trucks." CFO Richard Palmer, a Brit who formerly worked for General Electric Oil & Gas, had been Fiat's chief financial officer since 2006. His presentation was no-nonsense and numbers-crunching: Here's how we're going to make $3 billion in 2014. While Marchionne took questions, Palmer flipped through a stack of notes, feeding figures to the CEO from the far end of the stage. New Chrysler brand chief Olivier Francois, who continues as boss of Fiat's near-premium Lancia brand, says he is a composer and versed in fashion. Quoting Coco Chanel, Giorgio Armani and Ralph Lauren, the energetic Francois said he won't copy the marketing style of any car company. Instead, he showed TV commercials redefining Chrysler by using beautiful models, complete with plunging necklines, long legs and French kissing. He described himself as a Frenchman working for an Italian company and leading an American brand. Despite their varied personalities, Marchionne compared the members of the team to one of his favorite musicians, jazz singer Bobby McFerrin. Chrysler executives are learning to improvise. Said Marchionne: "Each of them is evolving quickly, feeling more and more comfortable with dropping sheet music and accepting the uncertainties and the excitement associated with competition."